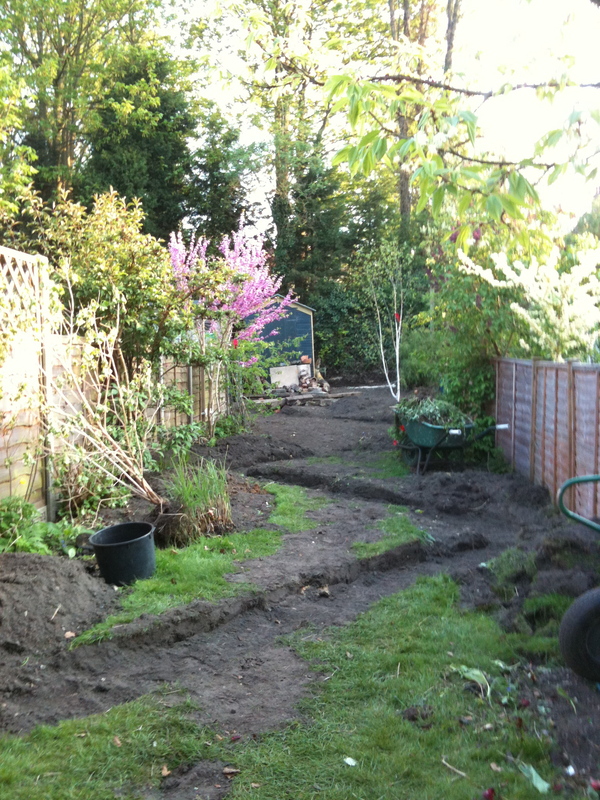 This is what I came home to after the guys had been at work for one day – just two of them, with spades and wheelbarrows! Originally we hoped to use a [small] digger, which would have fascinated the little boy next door, but the access to my garden, at the side of my neighbour’s house, was too narrow. They worked so hard, and April 2011 was hot. The diary images I’ve captured on my iPhone, and I used the Momento App to write up my impressions as we went along – and now I’m blogging the experience – don’t you just love technology? What this picture doesn’t show, probably because it was all a bit traumatic at the time, is the mountain of topsoil, removed from my garden, that the guys had deposited in the garden on the left hand side. I’d offered it to my neighbour for his allotment, rather than see it taken away; the soil round here is pretty good stuff. It was enormous, 3 tons or so – more than either of us had anticipated and he still had to barrow it to his allotment! We laugh about it now, but it gave me a bit of a sleepless night at the time. This entry was posted in Creating my garden, In my garden and tagged gardening, technology, transformation. Bookmark the permalink. It seems sacrilegious to give away topsoil you’ve been nurturing for a decade!